Our little Halle Grace is growing up fast. She will soon to a fifth-grader. This little girl is a gift from God, an answer to prayer. She came to our family via adoption. For her first 5 years she had lived in Ukraine, the last 2 of the 5 years were spent in an orphanage. Imagine for a moment what challenges Halle Grace has faced coming to America: new rules, new smells, new food, new customs, new friends, new things to laugh about, and a new family with two new brothers. Now, she is a lifetime away from that distant orphanage. Oh, her adaptation to this culture has certainly had dramatic moments, a few she has manufactured all by herself, but there is one word that rings true every day, hugs—she loves to hug. She is a gift of curiosity and willing service with hugs attached. Yes, she struggles with her brothers and has had her share of reprimands, but she knows she belongs. And the language of belonging doesn't have words... it's wrapped around hugs. Traditions, holidays, school friends, summer camps, water parks, museums, secrets, parties, TV, church, grandparents, cousins, freedoms, and limitations are part of her life now. But, her days are incomplete without a healthy dose of hugs. All this has caused me to think again about our adoption into the family of God. Even with a new heart and a new spirit, like Halle Grace, we face unexpected challenges trying to fit in. Some never learn the language of belonging. They never experience the hugs of grace. They live in the form of family, but miss the power of it. They can argue the doctrine, but they have never learned the language. So you have not received a spirit that makes you fearful slaves. Instead, you received God's Spirit when he adopted you as his own children. Now we call him, "Abba, Father" (Romans 8:15 NLT). God is the one who adopts us into His family of misfits; no matter what kind of family we have come from, we have a place in His. The God of heaven reaches down with arms of love and hugs us home. He delights in us, provides for us, and comforts us. And, if we let Him, His spirit teaches us how to show others they belong, He teaches us to make hugs holy. Halle thought she knew how to swim. She told Julie about swimming in the sea in Mariupol before her adoption. But that sea is so shallow, Halle could walk 50 yards into the water and still touch the bottom. So, when she got to the pool for swimming lessons she jumped right in... the deep end. She learned an important truth immediately; she didn't know how to swim. After the series of lessons, Julie took Halle Grace and the boys to the water park. Halle loved it; the water wasn't over her head. While they were in line near the top of a water slide Halle Grace began screaming. The lifeguard carried her down and Julie ran to catch up as they headed for the first-aid clinic. A bee had stung Halle, and the lifeguard asked if Halle was allergic, or if she had been stung before. Julie had no idea. She explained that they had recently adopted her from Ukraine. The lifeguard interrupted and said, "Does she speak Russian?" Have you learned how to make hugs holy? That young lifeguard immediately began speaking to Halle Grace in Russian! She asked her if she had been stung before and Halle Grace said no. She went on explaining that they were going to put some medicine on it and that it would be ok. All those words punctuated by a big bear hug. After Halle was treated and feeling a little better, the lifeguard explained that she had been adopted from Russia 5 years ago with her 2 siblings. More hugs. Comfort is given free of charge, wrapped in hugs. Have you learned how to make hugs holy? 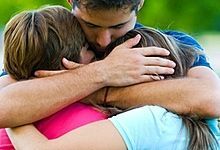 The holy hug shows people what acceptance and comfort and belonging feel like. It's the time when Jesus shows up, it's the hug that assures us, we belong. You will meet someone this week that needs such a hug. And there will be a time this week when you need the hug. Don't talk... just hug (not a hesitant, tentative hug). Make it a big, old-fashioned bear hug. And, don't forget the men, they need hugs too. Stop talking and hug. God will do the rest. God knows we've got a lot to learn about His family. So, He gives us challenges to keep us close, but enough freedom to know we need hugs. By faith, at the end of the day, holy hugs are more convincing than any words. Jesus lives in the squeeze. "Talk Less, Hug More" by Ron Rose is licensed under a Creative Commons License. Heartlight encourages you to share this material with others in church bulletins, personal emails, and other non-commercial uses. Please see our Usage Guidelines for more information.